The Trustees have met regularly and are pleased to report yet another extremely active year. The Trustees are delighted to be in regular contact with the new Dean, Professor Ervin Weiss, of the Tel Aviv Dental School regarding potential projects. The Trust has jointly sponsored a surgery in the new ‘Special Care Dentistry Centre’ for a total of £24,000. This was dedicated in May 2017 in honour of Emil and Suzy Landes in recognition of their many years of service to Alpha Omega and on Emil’s retirement as a Trustee. The Trust is also exploring the possibility of providing financial support in the purchase of a cone beam scanner during 2018.
to support undergraduate and postgraduate education as well as patient care and also the purchase of essential sterilisation cassettes for £4,000. Also at Hadassah, the Ino Sciaky Prize for Oral Medicine was awarded to Dr Gilad Wasserman together with a £400 bursary. Further to extensive discussions with Professor Eli Machtei, Head of the Graduate Dental School at the Rambam Medical Centre in Haifa, the Trust agreed to sponsor a new ‘Maxillo-Facial Reconstruction Department’. Unfortunately, planning permission has not been granted since our initial transfer of £12,500 in 2012. As this project can no longer be guaranteed, £7,500 of these funds were returned to the Trust during 2017. The remainder of £5,000 has been used to support essential paediatric dental care for refugee children in Israel. In association with Mrs Susan Zamet, the Trust continues to offer the ‘Dr John Zamet Memorial Prize in Periodontal Research’ in recognition of John’s significant contribution to clinical periodontology. Strict criteria have been established for award of the prize and two senior academics assess the submissions. The biennial prize was last awarded in 2015 and, moving forward, the Trust is delighted to confirm that the Zamet family have kindly agreed to sponsor the award once again in 2017 with a prize fund of £2,000. Royalties from the BDJ book “Tooth Surface Loss” by Andrew Eder and Richard Ibbetson have once again been generously divided between the BDA Benevolent Fund and the Alpha Omega Charitable Trust. 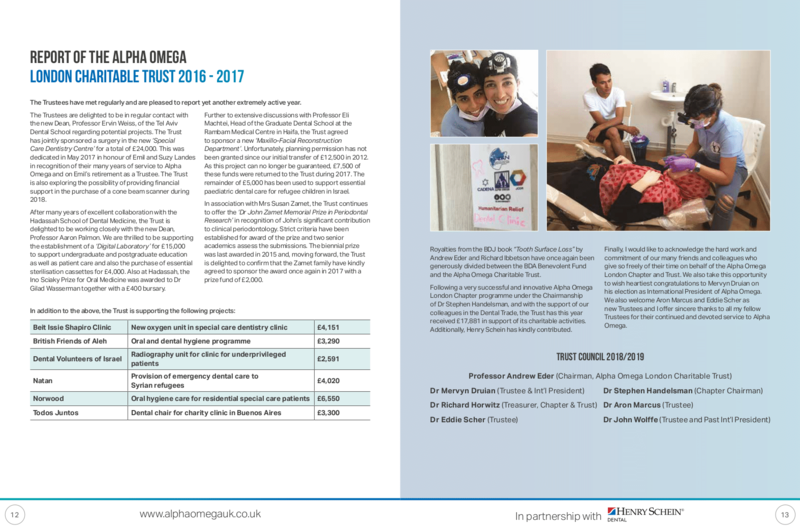 Following a very successful and innovative Alpha Omega London Chapter programme under the Chairmanship of Dr Stephen Handelsman, and with the support of our colleagues in the Dental Trade, the Trust has this year received £17,881 in support of its charitable activities. Additionally, Henry Schein has kindly contributed. Finally, I would like to acknowledge the hard work and commitment of our many friends and colleagues who give so freely of their time on behalf of the Alpha Omega London Chapter and Trust. We also take this opportunity to wish heartiest congratulations to Mervyn Druian on his election as International President of Alpha Omega. We also welcome Aron Marcus and Eddie Scher as new Trustees and I offer sincere thanks to all my fellow Trustees for their continued and devoted service to Alpha Omega.